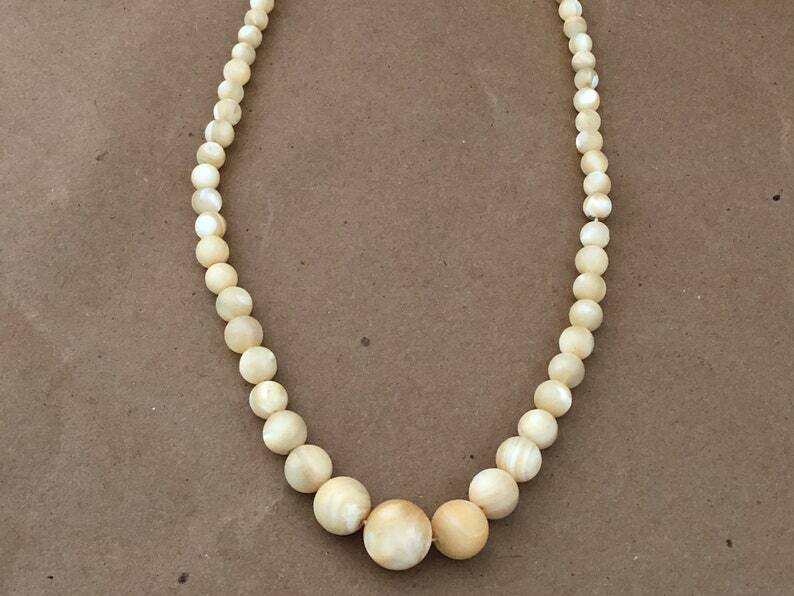 I believe that the graduated round beads strung on silk necklace twine are natural agate stones which came out of the earth with their basically dark cream color with swirls of lighter cream to beige color running through the stones. It is this swirling variation of color in the beads that gives the piece the extra dimension and charm of natural stone. The agate beads are lightly polished to give them a smooth uniformity, but they have a more matte effect than highly polished look. The necklace measures 24" and will slip over the head. It does not have a clasp. It is in beautiful condition with no flaws or damage to the beads, and the silk string that holds the beads seems strong.